Sometime after posting "Why Black Rock?" recently, I reran the first few episodes of the mind-opening 1995 PBS series "Rock & Roll" (wasted a half-hour trying to find link to the normally great PBS web page for this classic). I was blown away, again, by this quote from Ben E. King (you know, the original "Stand By Me" vocal?) 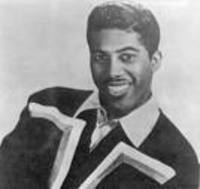 the former lead singer of The Drifters. James [Brown] covered what blacks felt they needed...to survive the Beatles. The Beatles had all of what the whites [rock n' roll acts] needed to keep them going. The thing we had created with the Drifters was in the middle of all that. There was no separatism there. We had collected a people to listen to a music. But when [The Beatles] came along... with that long straight hair... that changed the whole attitude of the music in a racial way. So there was no competition...we couldn't compare with that if we tried for another 200 years. Maybe...if we had had Michael Jackson...maybe. King was talking about the moment in rock history when race was allowed to divide the consumers and the creators of the music then known as rock n' roll. Until the Beatles and the "British Invasion" followed, that category included everything from the most sophisticated versions of black "doo-wop" (e.g. the Drifters) to Elvis to Ray Charles to California surf sounds (Beach Boys) to early Motown and "girl groups" like the Shirelles and the racially ambiguous Ronettes. And much more. The Beatles—still arguably the most important musical group of the last 50 years—had no idea of the collateral damage they caused. But, as the Shirley Reeves of The Shirelles points out in the documentary, many black acts were pushed off the pop charts as British acts covered their songs. My point: We need "black rock"—the spirit if not the music of a specific group— to point the way back to the hot minute when the Civil Rights movement and the racial unity in the music of a new generation were about to merge. As King (Ben E.) said, they had collected a people, despite the mountain of political contradictions and sheer racism that stood (and in some ways still stands) between them. These are the people I call "The American Race." It wasn't just The Beatles or their hair, of course. It was the strain that the bitter, inconclusive first finale of the Civil Rights movement (the assassinations and riots of 1968) put on the entire culture, musical and political. James Brown moved into (but didn't exactly invent) funk with the anthem "Say it Loud: I'm Black and I'm Proud." No non-blacks were invited to follow him. Meanwhile the white session musicians that were instrumental in creating the funkiest, grittiest "soul music" churned out of Memphis and Muscle Shoals, Ala. (think Otis Redding, Wilson Pickett and Aretha Franklin) had their collaborations abruptly cut off within a year of Martin Luther King's murder. Their interviews are telling and deeply moving. I think the Rock & Roll series (a co-production of WGBH, Boston and the BBC) is available on DVD. This is the kind of "where we came from" that matters for anyone concerned about where we're trying to go. In a post-Imus world where hip hop is under attack (rightfully on some counts), the African American community needs Black rock now more than ever. Do you agree? Disagree? I’d like to hear what you think. —Rob Fields, Bold As Love, "Speak Out"
Before answering, I mashed up a new Pandora "radio station" based on "Sly and the Family Stone." The first song was one of the last great funky Stone tablets, "If You Want Me to Stay." The next thing the ghost in Pandora's machine served up was a righteous cover of "Thank You" (Fa Lettin' Me Be Mice Elf) by the very voodoo Dr. John. That's why we need the music that, for now, goes by "black rock." It reminds us of who we are, or rather, who we were about to become before the most commercial forms of rap/hiphop hijacked control of black identity. I'm happy, I'm happy/ 'cause my mamma loves my pappy/makes me wanna Samba/Are ya' happy? Are ya' feelin' real good?/Is everybody happy that we're still alive?/We have a will to live, and a reason to survive. We need music that affirms the human spirit within us, especially with the kind of acapella gospel shout at the end: "Are ya' happy? Are ya' feelin' real good?" In the song the question is rhetorical; of course you're happy clapping your hands and stomping your feet for three minutes of joy in the midst of whatever. But with my head in the question at hand, about the music that currently tries to define and confine my blackness, the answer would be "hell no, I'm not happy!" We all need music that invites us into community, instead of sending us running for cover. The genre—black, rock, funk, pop, rock n' roll, R&B, country, blues, gospel—is irrelevant. Repeat: irrelevant. Don't believe me? Go check out a play list from WABC-AM, NY, the most listened to station in the nation even in the early 1970's. Its double-digit share of the largest media market would be unthinkable today. 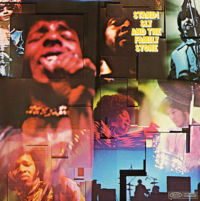 Staple Singers, followed by Rolling Stones, Sly, Glen Campbell, Dr. John, Marvin Gaye, Led Zepplin and James Brown, and nobody thought twice about it. Even the most pop stuff of what we now call World Music—Miriam Makeba's "Pata, Pata"— was in the house. We listened, sampled each other's stuff until it was hard to say who's was who's, which is exactly what American music, and Americans should be. We need "black rock" until an even better term comes along for what used to be the mainstream of American musical identity. We need black rock as the first stream to replenish the mighty river from which, and in which, gospel, blues, jazz, Broadway, country... all of our musics...once flowed in peace, however uneasy. We need music that bends race and ethnic identity until they break. So hip-hop is "officially rock 'n' roll", declares Jon Pareles in today's New York Times. But rock is supposed to be white, and hip-hop is supposed to be it's authentically black antithesis. Is rock now less white, and hip-hop less black because Grandmaster Flash has been installed in the Rock 'n' Roll Hall of Fame? Or did the Furious Five just crossover as an oldies act? This is way too much for me to parse. Naming is framing, says Rob Fields at Bold As Love. Maybe Rob can shed some light on this. Bold As Love—Black Rock and the new Black Imagination, blogs new ground in rethinking the relationship between black people and the popular cultures in which we swim. It's especially focused on rock, which, of course, black folks invented. Let me advocate for you-know-who. What does hip-hop (Def Jam CEO and rap impresario Jay-Z doing the inducting) need with rock 'n' roll cred—besides, of course, more money? Moreover, what does rock need with hip-hop, of any school? Is it also about the money, laced with guilt for not being concerned about the genial state of commercial apartheid that still rules the cultural and commercial marketplace for rock? Is hip-hop really the new rock 'n' roll, as Def Jam's founder always insisted? Where does that leave black folks who are still into the old rock 'n' roll?